My power is made perfect in weakness." 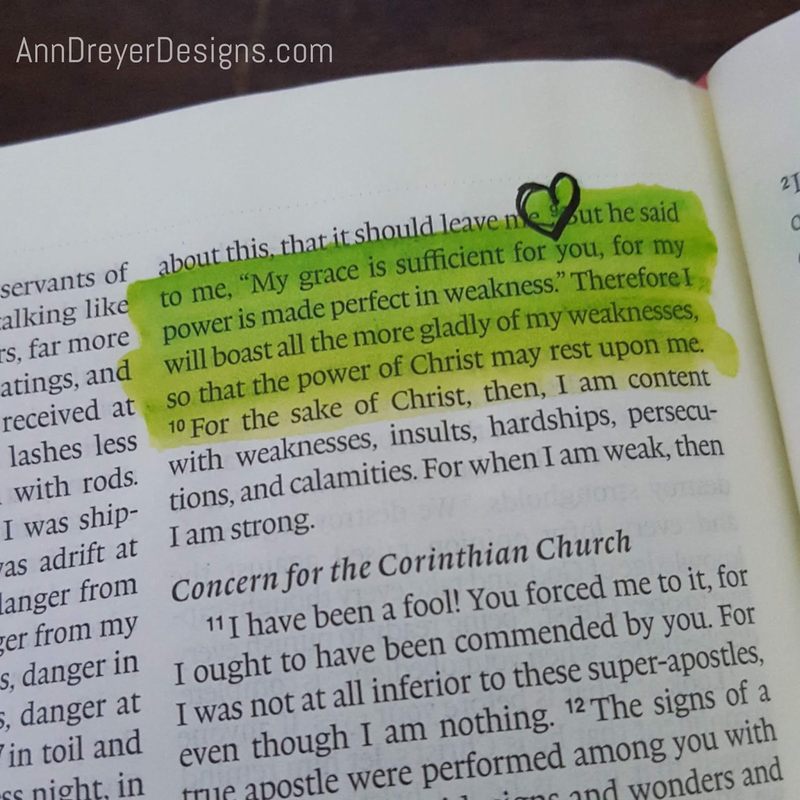 Who else needs an extra dose of grace today? Me too! 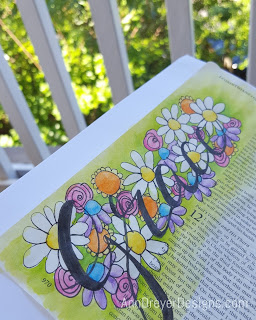 It was a looooong week and I was so grateful for some time yesterday morning to listen to some hymns and paint in my Bible after praying and hearing God whisper to me that I needed to relax all day and give myself some grace. I pictured this page in my head and am so happy with how it turned out. It's not perfect, but ... GRACE! I had a fun, relaxing time while working on it. And that's what was needed and important for me at that time. I would love to share with you how I created this page. I had watercolor pencils for years before I used them. 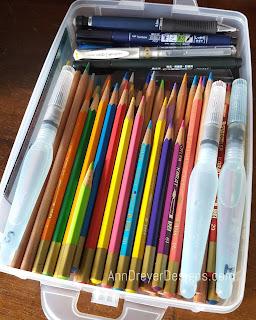 Now they are my go-to art supply and I want to share how easy (and portable) they are! 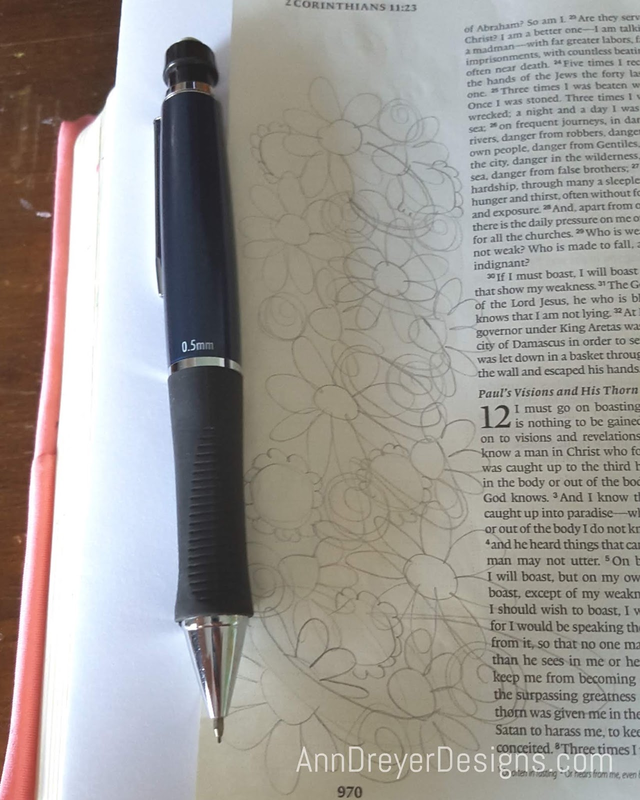 I have my most used supplies in a little container from Snapware (I got them with a 40% off coupon from Joanns) and this way if I want to get away to a bookstore or the park, I can just grab my Bible and the little container and go. Below are affiliate links, which means I receive a small percentage if you make a purchase using these links. I am a participant in the Amazon Services LLC Associates Program, an affiliate advertising program designed to provide a means for me to earn fees by linking to Amazon.com and affiliated sites. 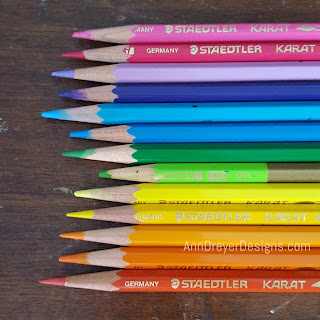 watercolor pencils (both Staedtler Karat and Prismacolor) both come in different quantities. 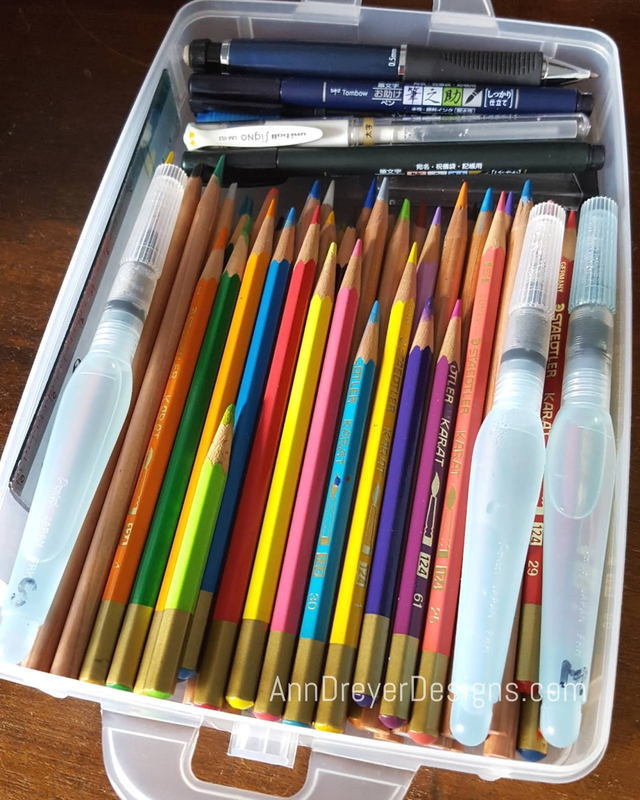 I was gifted 36 of the Karats 20 years ago and purchased the 24 pack of Prismacolors 2 years ago. 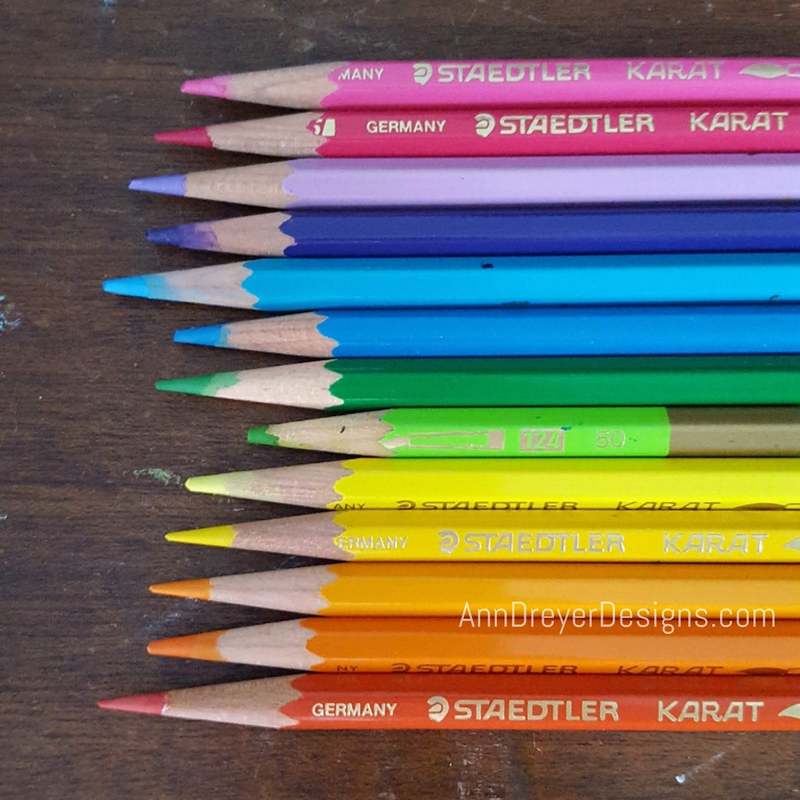 I love the brighter color options in the Karats and they "activate" very well, but the Prismacolors go on buttery smooth and blend nicely. First, I sketched my design with a pencil. I knew I wanted the word "grace" in bold with different flowers behind. My go-to flowers when doodling are a daisy (small circle with a lot of long petals), a sunflower (a large circle with tiny half-circle petals), a rose (a circle that spirals in to the center), and a coneflower (a half circle on top with 5 petals below). I allowed the flowers to overlap and planned to clean them up during the next step. Once I was happy with the sketch, I inked the lines I liked starting with the word. Then I moved on to the daisies. 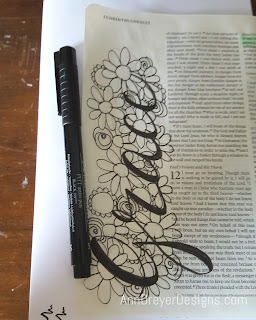 As I inked the other flowers, I omitted certain lines to make them appear under the daisies and the word. 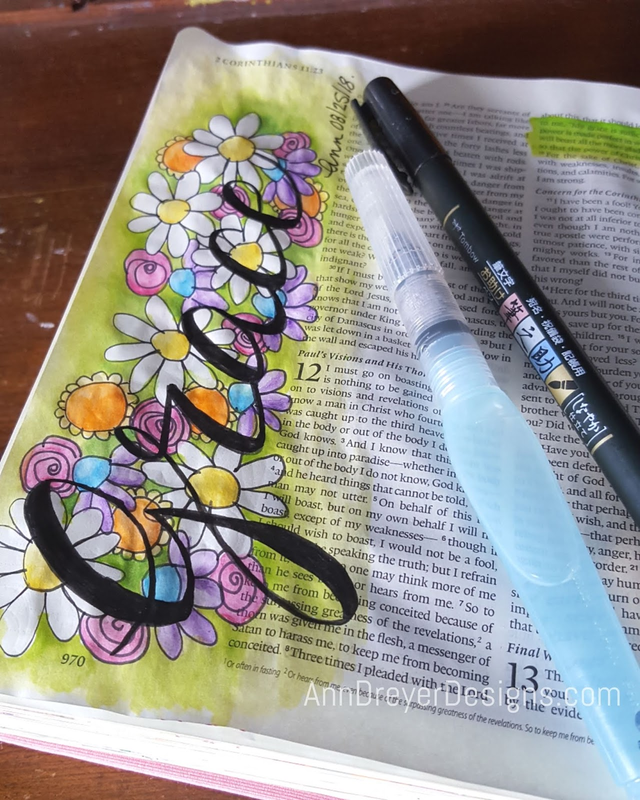 I prefer the Pitt pens as they are waterproof and do not bleed when I activate the watercolor pencils. Now the fun step... coloring! I picked out my favorite colors and made sure to get 2 or 3 shades of each color. I started with the lighter color and then added shadows with the darker color. For example, I colored the rose a light pink and then added darker pink to some of the petals (specifically on the bottom left of each element). 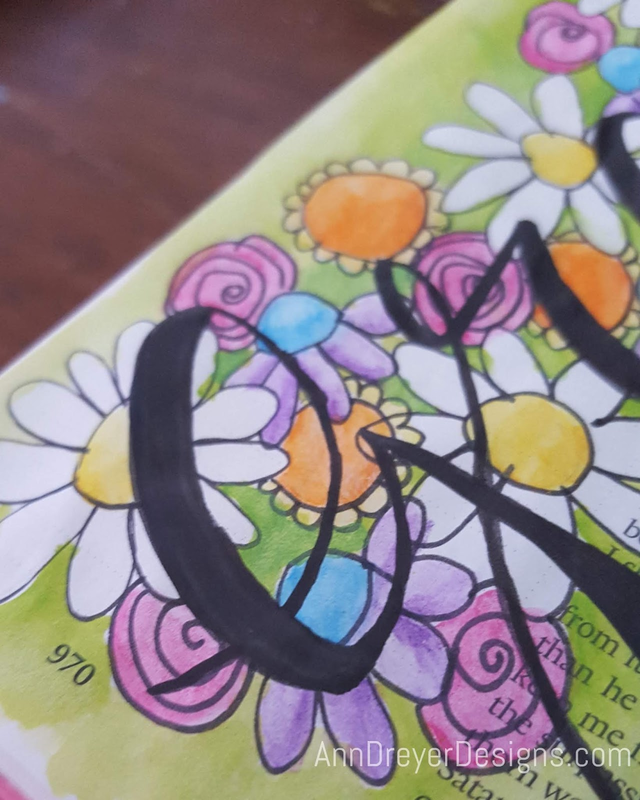 Keep coloring and shading as much or as little as you want. And now on to step 4. Activate! 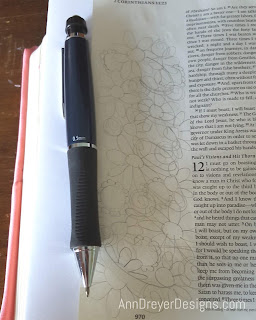 I use a waterbrush... again for the convenience and ease of portability. It is a paintbrush that houses it's own water supply in the handle and the water wets the bristles when you gently squeeze the handle. I pick the lightest color first (yellow here) and gently swipe the brush over the colored areas. After activating a shaded area, I wipe the brush on a tissue to get the color off or else it will transfer the darker, shaded color to the next lighter yellow area I activate. Repeat this process (cleaning your brush between colors) for all flowers. Keep in mind that if you activate the purple coneflower petals before the blue tops dry, the purple will run into the blue. 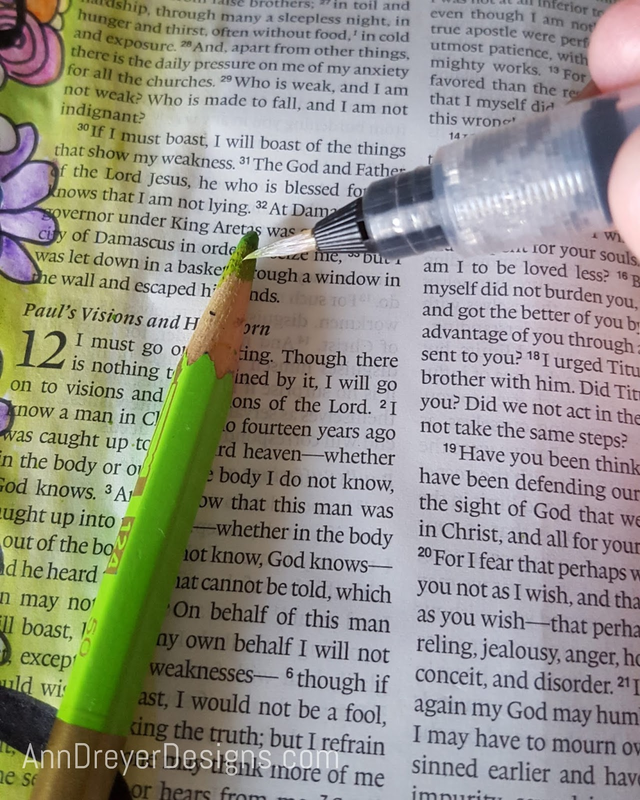 Fortunately, since the Bible pages are so thin and such a small amount of water is used, each color dries quickly. Now when coloring the background green, I used a different technique. 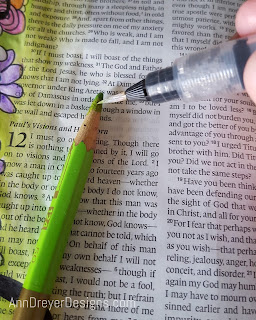 Instead of coloring + activating, I dabbed the wet brush directly on to the pencil thus "lifting" off some of the color and then put the brush directly to the page (as if I were painting with actual watercolors). This allowed me to control how intense or diluted the color was in different areas. Once dry I noticed that the word had faded a bit from the water (I had used a different pen). 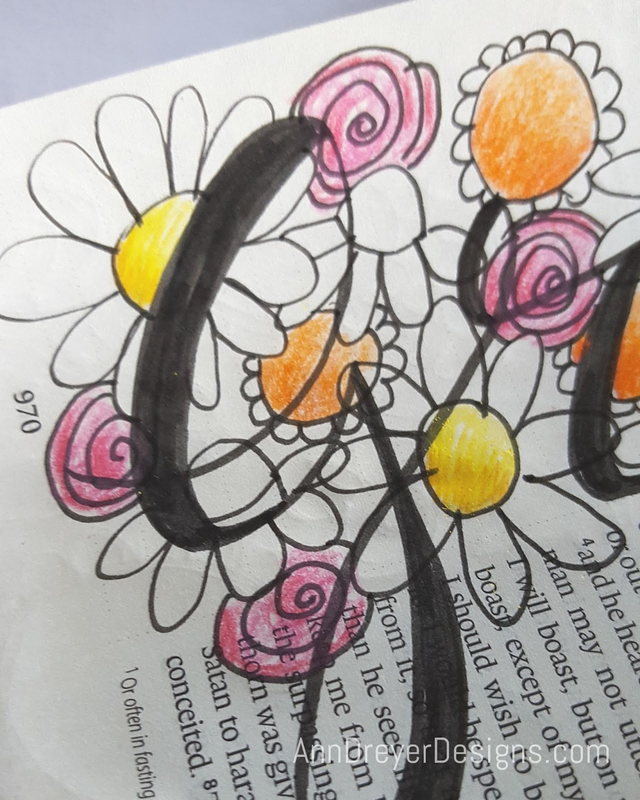 So I simply went over it again and it made it nice and bold... standing out from the outlines of the flowers even more. Tada!!! I finish my pages by "highlighting" the verse with the above watercolor technique, adding a heart on the verse number, and then signing and dating it. 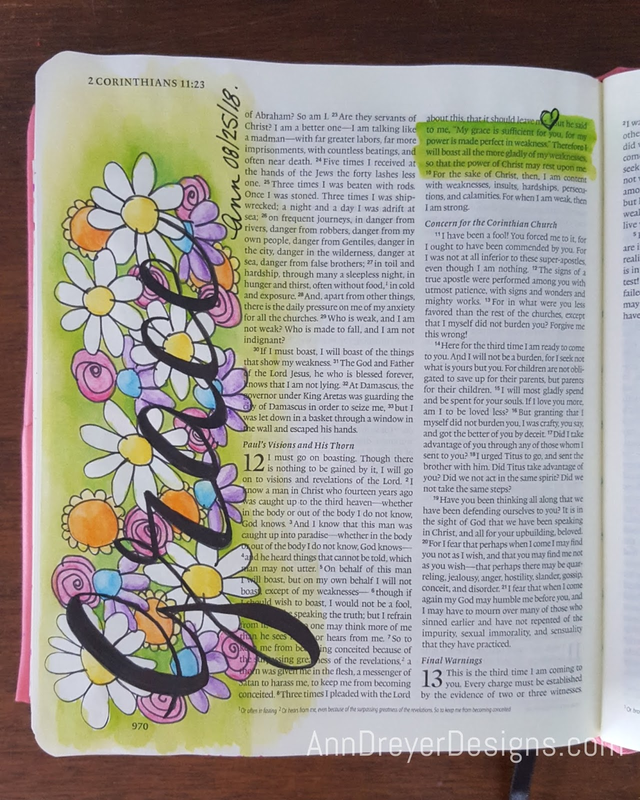 It's funny to look back over pages now and see the date and remember "oh yeah, I was sitting in this room painting and God was helping me go through this season or that circumstance." 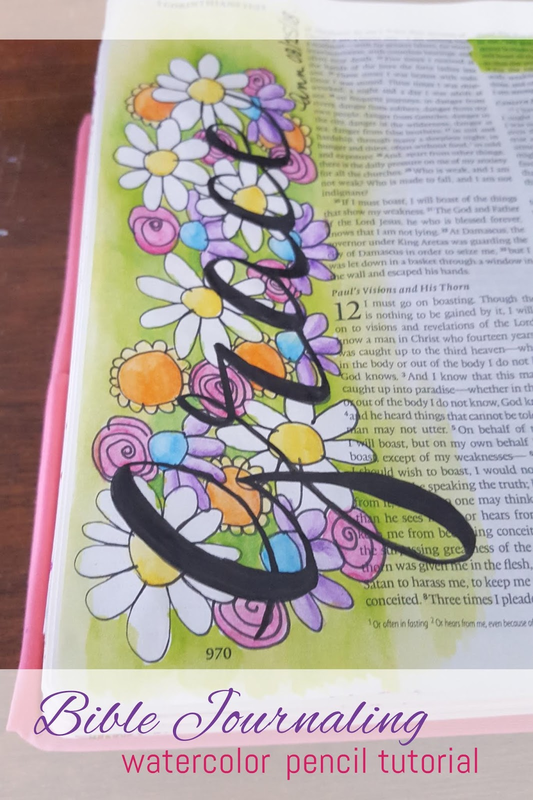 I hope you enjoyed this tutorial for simple, easy, fun Bible Journaling. You are creative! 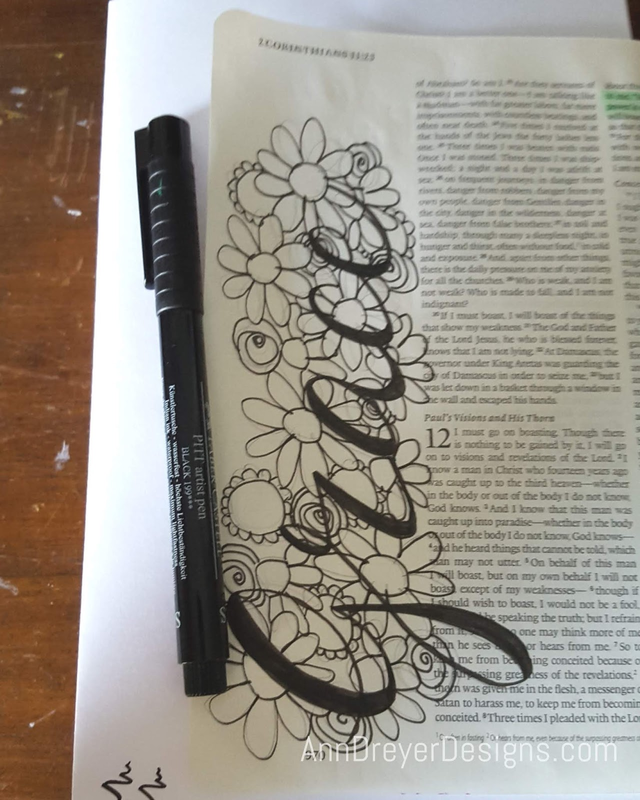 God created all of us in His image and as the Creator, He made us creative. 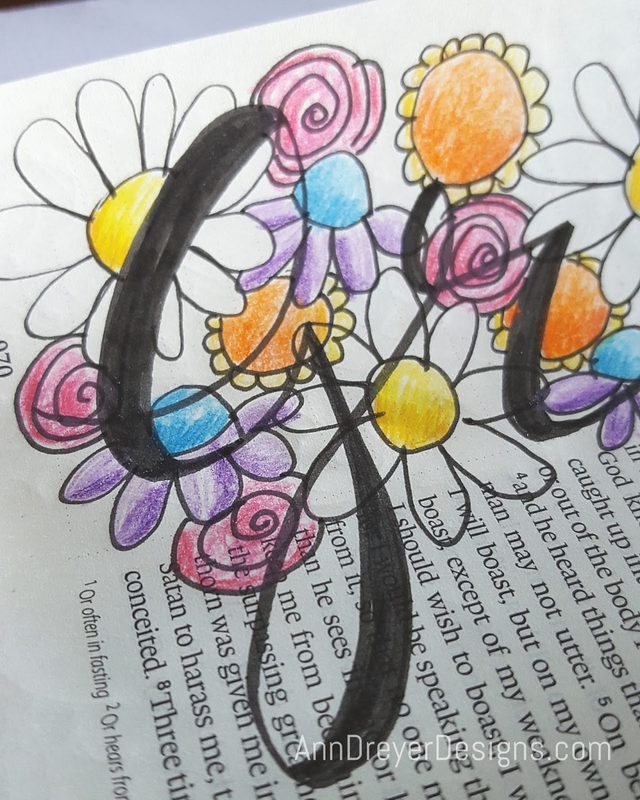 Give yourself some grace, have some fun, and get to doodling His promises to you!!! PS - I did do a few mixed media pages last weekend and hope to share those with you soon. Your step by steps are so helpful and i LOVE that you list your supplies. Grace is always something we need to remember.